I was overdue for a visit to Night Shift when I stopped in for a few quick beers on my home from work the other day. They had apparently put out a lot of new stuff since my last time at the brewery, so a round of samples was obviously in order. The first beer of my flight was a 7.0% IPA they were calling Generator. Brewed with Vic Secret, Azacca, and Idaho 7 hops, I had high hopes for this one considering how much I liked these in the brewery’s One Hop series. While this beer fell slightly short of my heightened expectations, it was still pretty good. It poured a slightly hazy pale yellow and smelled of honey and just a hint of yeast. As for the taste, it had a moderate level of bitterness accompanied by a bit of sweetness before coming to a zesty lemon finish. My next beer was a 5.3% dunkelweizen named Emden. I didn’t really care for this one, mostly due to the peppery opening taste. The banana and slightly malty, yeasty finish I liked a bit better, but ultimately this wasn’t the beer for me. Just not my preferred flavor profile, others might like it. 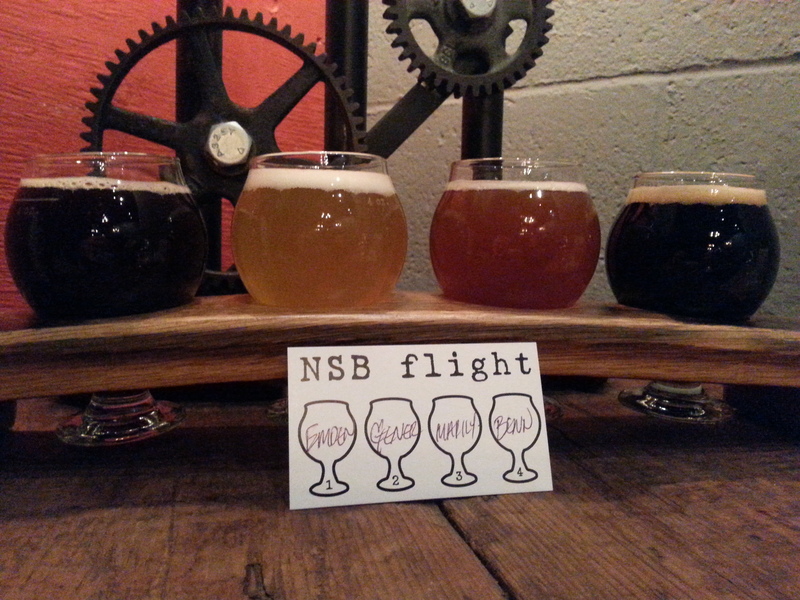 At beer number three this flight got real with a fantastic 7.1% Maple Stout called Benningon. Pouring with an expected dark black body and fluffy tan head, this brew smelled like chocolate and tasted like breakfast. Coffee, maple, and cocoa were present throughout. The beer finished with roasty bittersweet chocolate at cooler temperatures and took on a smoother chocolate and dark malt profile when it warmed up a bit. Body was on the thicker side and suited the beer very well. Closing out the flight was Marilyn, a 10.2% blonde barleywine aged in apple brandy barrels. It poured an opaque amber/tan body with a thin but persistent foamy white head. The smell was very assertive caramel and toffee sweetness. Intense levels of toffee and caramel dominated the taste as well, but were mixed with a noticeable brandy heat at the start and finish. The mouthfeel was quite thick with very minimal carbonation. Overall it brought to my mind thoughts of a Worther’s Original candy melted down after being left to sit in brandy barrel for a few months. I really loved this beer and would say it edged out Bennington as my favorite of the day. With the flight ending on such a high note, I went for one final sample to close out my night. 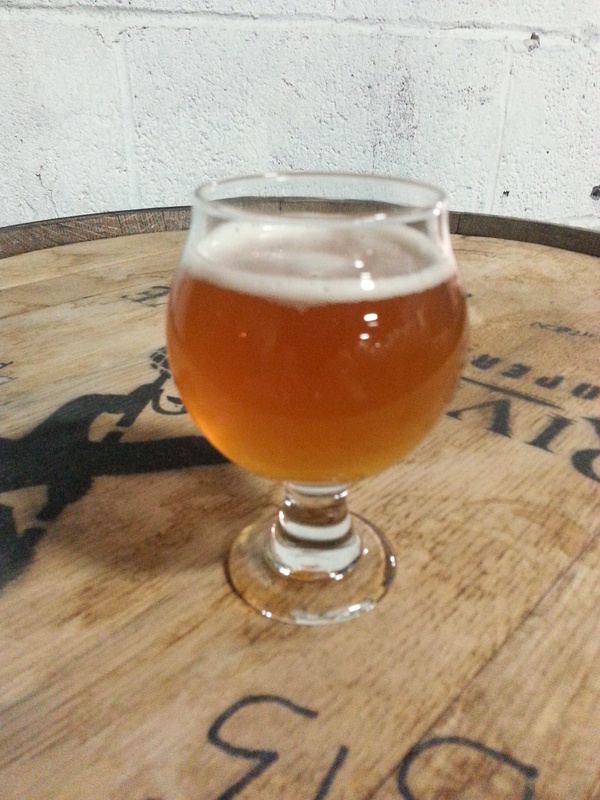 This was Barrel’d Trophy, a wild farmhouse ale brewed in collaboration with Trophy Brewing Company from Raleigh, NC. The beer was actually brewed during last year’s Extreme Beer Festival and has been aging patiently in chardonnay bottles ever since. It poured a light golden amber body topped off with a generous white head. Smell and taste were both fruity and funky and absolutely right on for the style. The fruit (apple maybe?) was a bit on the tart side and the moderate funk had a mature hay-like presence over the beer, perhaps amplified a bit by the barrel influence working in the background. Light and a bit syrupy like the regulars in Night Shift’s sour lineup, it was a bit of a shock to see that this was 8.5% as it hid the alcohol quite well. Very good beer and a great ending to my visit. I am on a bit of a reading spree and have another book to share. I was looking for something to pass the time until some library holds came through and happened upon The Pride of Carthage, by David Anthony Durham. Published in 2005, this is a historical fiction written about Hannibal Barca and the events of the Second Punic War, fought between Carthage and Rome from 218 to 201 BC. I really don’t need to worry about spoilers do I? The novel opened on the Iberian peninsula with Hannibal and his army preparing to take the city of Saguntum, a Roman ally isolated in Carthaginian controlled territory. After a prolonged siege, Hannibal’s forces prevail and in short order Rome issues its formal declaration of war. From here on out the book is the story of that war, largely from Hannibal’s perspective. It covered Hannibal’s famed overland march from Iberia to Italy; a journey in which his army of 100,000 soldiers marched over the Pyrenees, through territory held by war-like tribes of Gauls, and finally up and over the Alps to wage war on Roman soil. We are then given accounts of some of the key battles in Italy before concluding the story with Hannibal’s defeat. Rather than present only the historical record, the book also sought to portray the thoughts and feelings of the people involved in the conflict. While Hannibal was the main focus of the book, it also spent a significant amount of time on the military campaigns of his brothers and the lives of his sister and wife through whom we get a glimpse of how the war is perceived back in Carthage. Later on, we are given more of the Roman perspective as Publius Scipio becomes a point of view character as well. Woven into the larger narrative there was also a storyline involving the lives of a rank and file soldier named Imco Vacca and a camp follower named Aradna. While on the whole I liked the book, I do think it had a few flaws. Perhaps the biggest thing for me was that it was difficult to get a sense of the timeline or scope of the story. I do not recall any specific dates being mentioned, and often more minor points would get just as much page time as major events. I also found myself wishing that visual aids had been included. There were times a map of the local region or a depiction of battle formations would have enhanced the experience for the reader. I really get into stuff like that and was minorly disappointed to not have any of that in the book. To supplement for this, I started looking up information about certain events, locations, and battles from other sources. In doing so I uncovered a number of (not entirely unexpected) historical inaccuracies in the book. To be clear, I understand this is a necessity in telling a story like this and the author makes it explicitly clear in his acknowledgments at the end that some things are purposefully done for the sake of clarity and brevity in the story. However,the decision to take certain liberties with the Barca family tree and some other historical figures did throw me off a bit once I became aware of them, mostly due to my interest in getting further into the actual events. I was also not entirely sold on the development and depth of the book’s cast. While the author did a good enough job describing people and locations, he didn’t quite do enough to give the reader a chance to get into characters’ heads. I felt that they came across as fairly one-dimensional and many references were made too much with a modern reader in mind, making it harder to get a real sense of the historic context. Also, while I did appreciate the idea of including the perspective of everyday characters, the story of Aradna and Imco Vacca never developed in a way that added anything interesting or meaningful to the overall narrative. It felt like filler for space that could have been put to better use, like a point of view section from one of Hannibal’s political opponents in the Carthaginian government. Fairly or not I couldn’t help but compare the book in my mind to different historical fiction that I think skewed my view of this one. Colleen McCullough’s Masters of Rome series, a seven book masterpiece spanning the years 110 – 27 BC, provided in abundance the things I wish had been included in this novel. It offered numerous maps, battle diagrams, and an extensive reference section complete with a huge glossary and footnotes to explain terms, concepts, and mention how certain sections were compiled based upon her research. Taking advantage of all these extras, McCullough also incorporated a lot of Roman terms and phrases in ways that really helped the reader jump into the world through her expertly crafted and fully fleshed-out characters. This made for a much denser and more in depth read, but also one that I found significantly more satisfying. My criticisms aside, I did have fun reading this book and was able to enjoy it for what it was. That I have an interest in the subject matter was surely a key part of that, but I did appreciate the light and easy to read style in which it was written. While I wasn’t blown away, the novel was interesting and I had no problems getting through the nearly 600 pages in short order. While I can’t wholeheartedly recommend this in light of my criticisms above, I wouldn’t warn anyone to stay away either; it really depends on what you’re looking for in the genre. If you prefer to keep things light, keep this book in mind. If you prefer something a bit more dense and detailed, I’d say skip this and go check out that Colleen McCullough series. Stone was one of my favorite breweries when I first started getting into beer, but for some reason or another I haven’t had a chance to properly sit down and enjoy one of their beers in quite a while. Of course seeing them put out a Red IPA got my attention in a hurry. Imperial Royal Guard not included. Description: Stone provided one of their usual verbose back stories to the beer on their bottles and website, but for the condensed version they created this brew using German Red X malt and Amarillo, Cascade, and Mosaic as dry hops. Bottled on 01/21/2016, the beers for this review were consumed during the second week in February. Pour Info: One refrigerated 12 oz. bottle at a time. Appearance: It had a dark amber body, with a cranberry juice-like glimmer when the light hit it just right. An off-white bubbly head formed on the initial pour and rapidly fizzed away. Smell: Slightly sweet with dank hops lurking in the background. Taste: Citrus and sweet malt upfront. Dank resinous hops come on quickly and dominate through the finish. Assertive bitterness and grapefruit hops abound, with the malt largely taking a backseat after the initial taste. Mouth feel: Smooth and medium bodied with a moderate amount of carbonation. It also had a sticky feeling, especially when cold. Hype Factor: The beer was well advertised and not exactly difficult to come by. Doesn’t mean I wasn’t excited though. 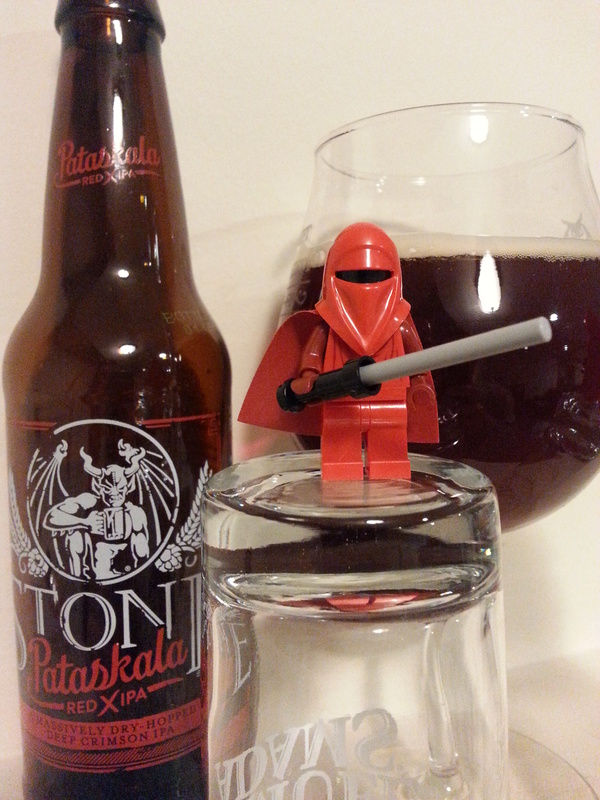 I’m always eager to try out a Red IPA and was very curious to see how Stone would handle the style. Overall: I thought this was a very good beer and liked the hop profile a lot. Keeping true to my well documented Red IPA preferences, I wish the malt stood out just a little bit more to prevent the hops from taking over entirely. At $13 for the six-pack, this was slightly more expensive than the Ipswich Ruby Red IPA I had last week, but still at a decent price for my market. Worth checking out. Here we go again with another Red IPA. You all know it’s my favorite style, so I was pleasantly surprised to see this on the shelves while stocking up for my birthday weekend. Game on! 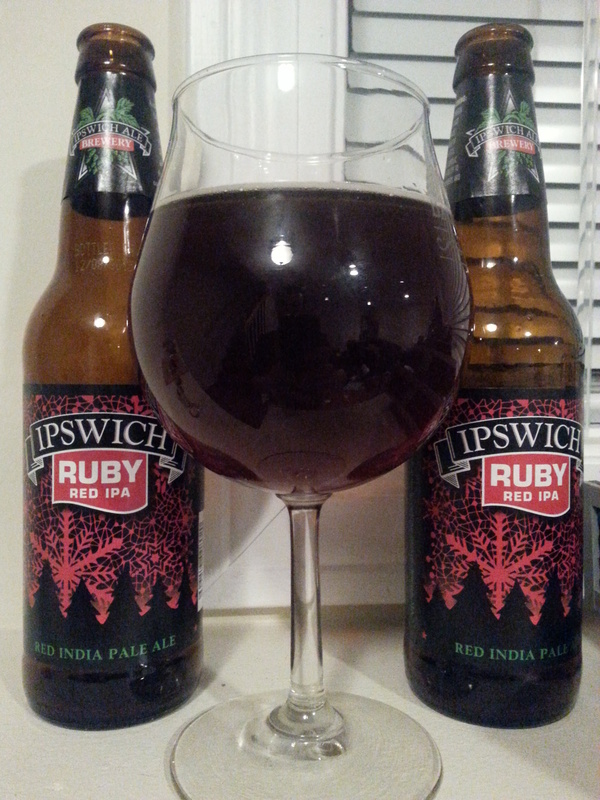 Description: It’s a Red IPA! All I could find out, all I needed to know. The brewery is in the process of upgrading their website, so perhaps more details will be forthcoming. Pour Info: Refrigerated 12 oz. bottle into a snifter glass. Times six. Appearance: Poured a deep amber body that shines red if light catches it from the right angle. Up top was a fluffy off-white head. Smell: Assertive caramel malts with a hint of bitterness lingering in the background. Taste: Almost the inverse of the smell. The beer starts out with sweet caramel malts that get taken over mid-sip by piney hops. The finish is resinous bitterness, mixed with more caramel malt, brown sugar, and just a hint of roasted malt. Mouthfeel: Maybe slightly on the thicker side of the medium body that is typical of this style. Solid amount of carbonation that stuck around even as the beer took on a more fluffy and creamy feel when allowed to let sit for a while. Hype Factor: May be under-hyped? I don’t want to build this up too much, but in my experience this brewery quietly puts out some very good brews. Overall: This was a solid beer at a great price. I wouldn’t call it the best I’ve ever had, but the beer did rate highly with me as it offered both the sweet malt and bitter hoppy characteristics I look for in this style. Also, at $9.99 a six-pack this was very competitively priced in a convenient format. No doubts about it, I’d pick this up again. A cold winter day calls for breaking out a nice big stout to keep you warm. This was yet another one of my Christmas beers, so cheers to my wife for keeping me properly hydrated this season! 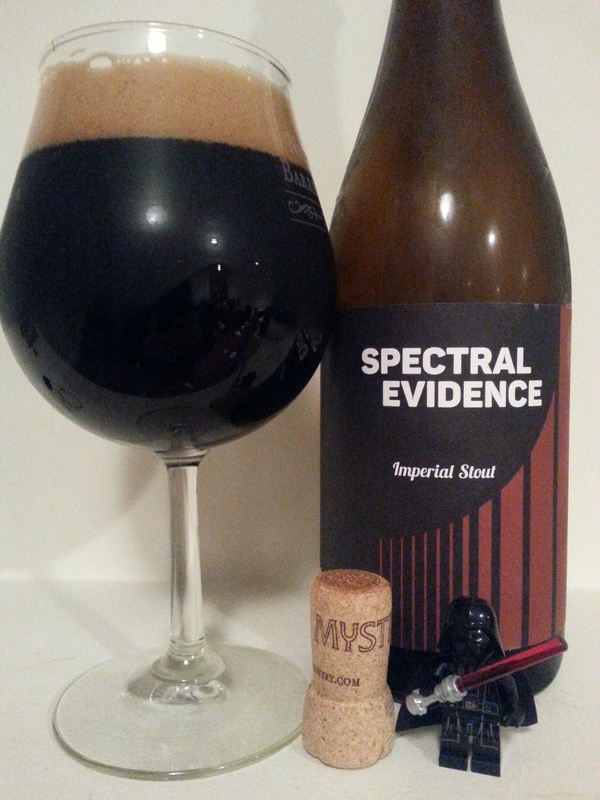 Description: I don’t have much info to share other than I had the 2015 vintage of this bottle fermented Imperial Stout. Pour Info: Poured from a refrigerated 750 ml. corked and caged bottle into my drinking vessel of choice. Appearance: Solid black body with a two finger foamy tan head. Smell: Mild hints of sweetness and alcohol. Taste: There were a lot of diverse and very intense tastes going on with this one. Dark malts and bittersweet chocolate were present throughout, occasionally imparting slightly earthy notes. These combined with a sweet alcohol heat and finished with roasted hazelnut coffee and mild to moderate bitterness. I found that the beer was it was at its best when left to sit out for a few minutes. When drinking the beer cold the tastes didn’t really come together nearly as well as they did as the it approached room temperature. Mouthfeel: Thick and fluffy with minimal carbonation. Super smooth and really pleasing. Hype Factor: I always feel like I don’t drink enough of this brewery’s beers, so I went in excited. Overall: Well done and flavorful beer. It can be a bit much to drink solo, but don’t let that scare you off. It’s a sipper and a sharer. Going back to another re-read before moving down my list and picking up something new. This time around I went back to Hyperion, by Dan Simmons. This book and the three installments that follow it are among the works that inspired me to make this blog about more than just beer. And even though I am only reading the first book this time around, this series may have Dune-like staying power on my annual reading priorities. For those that haven’t read it, the action takes place primarily on the beseiged planet of Hyperion, which is preparing for invasion by the Ousters – genetically modified human offshoots who centuries earlier abandoned planet-bound life to exist on colonies built to roam between the stars. As the human government, named the Hegemony, scrambles its defense forces and a desperate populace seeks to escape a warzone, the novel follows seven pilgrims who have been sent to Hyperion on a mysterious mission to reach the Time Tombs, the site of a temporal anomaly at the heart of the looming conflict. Guarding its secrets, however, is a terrifying creature known as the Shrike. Clad entirely in black spiked armor the Shrike is rumored to travel through time with a massive metallic tree on which it impales its victims for eternity, a feat which inspires terror in most and religious awe in a select few. As each pilgrim shares the story of their connection to the planet (a la the Canterbury Tales) trying to piece together the reasons for their mission, the complex and fascinating universe created by Dan Simmons reveals itself to the reader, providing a glimpse into the forces and conspiracies driving their journey. As a warning, this first volume ends rather abruptly. If you’re finding yourself really enjoying this book, make sure you have its sequel, The Fall of Hyperion, on hand! So, obviously I like this book if I am taking the time to re-read it and write a post about it. I don’t want to give too much away here for those that haven’t read it, but I really liked some of the technological concepts and the exploration of the social, political, and ecological systems within the Hegemony’s empire. The things that really kept me thinking about these books though were the individual stories and how they were told. It was fascinating how the story and universe slowly unveiled themselves as the pilgrims progressed on their journey and shared their lives. I think the author did a great job giving each tale a distinct feeling that really gave each character their own unique individual personality. Stylistically, the mixture of horror, military sci-fi, detective narrative, and memoirs of failed liberation movements and lives of excess really expands the story in an organic and free-flowing way. Equal parts eerie, mysterious, exciting, triumphant, and deeply sad this book offers up a lot of emotion, which is not something I say very often. My favorite stories also happen to be the ones I think best capture these moods. Brawne Lamia’s tale provided probably the most action and adventure while simultaneously introducing the book’s third main faction: the TechnoCore, a society of Artificial Intelligence that withdrew from human control yet remains in alliance with the Hegemony to advise humanity and maintain its technological networks and infrastructure. This one story alone is both a detective narrative and an action tale full of fantastic technological aspects and classic sci-fi. The Consul’s story, though, was probably my favorite . It combines a social/political view of the Hegemony, a commentary on the damage “progress” can cause to the environment, and behind the scenes information about the inner-workings of the forces driving the pilgrimage. I don’t want to give away too much here, but this section definitely provided a strong finish to the book. Looking back, I think it is kind of interesting how into this series I have become. I clearly remember the cover from my days of working in the town library while I was in high school. The alluring figure of the Shrike staring out at the ship crossing a sea of grass never failed to grab my attention (right along with all those wacky smiley planets on the Hitch-Hikers Guide to the Galaxy), but for some reason I never gave it a read. However, when I read somewhere that this series helped inspire, however loosely, the game Civilization: Beyond Earth I took that as a sign to pick it up. I couldn’t be happier that I did. Definitely recommend. In the spirit of my Dune review, some quotes follow the break. Since they may inadvertently reveal spoilers, consider yourself warned.